Designed to tackle the most demanding jobs, this watering nozzle is easy to operate and built to withstand professional use, year after year. The nozzle head has been refined to eliminate excessive settings so the pattern you need for the job at hand is easy to find and actuate. The optimized location of controls means there's no straining to reach and make adjustments. Gilmour's redesigned handle features structured contours to ensure that the nozzle fits snugly in your hand, for greater comfort and control. The thumb-trigger design offers a complete flow range from off to on, so you can easily take on all kinds of tasks, from lightly watering seedlings to soaking heartier plants. This product's gentle spray is excellent for flowers, shrubs, and newly seeded areas. The spike holds the base at any angle for optional hands free watering. It can easily be adjusted with finger tip flow control and the shut-off valve. 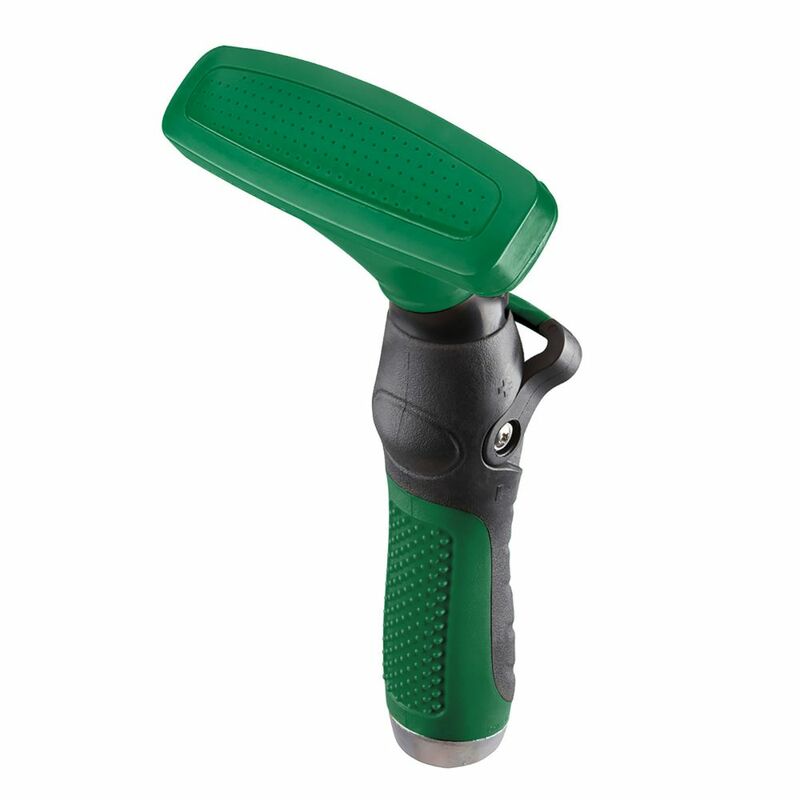 This Shrub Head has a durable plastic insert nozzle and a 1/2 in. FNPT (Female National Pipe Thread) inlet. The plastic nozzle is designed with a center strip spray pattern. This shrub head is also designed with a filter that prevents debris from clogging. Thumb Control Fan Spray Nozzle in Green Thumb control fan spray nozzle. Ergonomically designed thumb control fan spray nozzle. Spray head delivers a precise , gentle watering pattern. Constructed of a high impact materials will not rust or corrode.